The Triangle Club of Montgomery County, Pennsylvania, is a non-profit, volunteer organization comprised of a group of diverse citizens who work in cooperation with Montgomery County high schools to recognize, aid, and assist worthy students who have excelled in scholarship, sports, and/or service, for the encouragement of comparable student achievement, so they may have a positive influence on the lives that they touch. Each year, the Triangle Club awards three annual college scholarships. The winner of the prestigious William F. Dannehower Award receives $3,000. The first runner-up receives $2,000, and $1,000 is awarded to the second runner-up. Through the generous donations of Shannondell Retirement Home, three additional scholarships for $500 each are awarded. 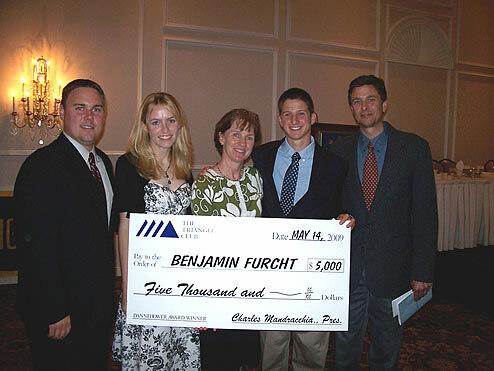 Benjamin Furcht of Lower Merion High School and family members. The Triangle Club of Montgomery County was established in 1963 to promote service, sports, and scholarship among public, parochial, and private high school students in the county. During the spring of each year, the Triangle Club honors the top scholar-athletes from all area high schools, at which time the most outstanding is selected to receive the William F. Dannehower Memorial Scholarship Award. The award is named for the late President Judge of the Montgomery Country Court of Common Pleas, who assisted in the formation of the Triangle Club, and whose life exemplified the ideals of scholarship, sports, and service.